Peterborough Phantoms’ recruitment drive has taken them to Hull and back! The city club have raided their English Premier League rivals for two players in the space of just three days. Hot on the heels of the capture of forward Sam Towner from the Humberside club, Phantoms have now added teenage Hull defenceman Tom Stubley to their ranks. Coach Slava Koulikov described the move for Stubley – a Great Britain Under 18 international – as a ‘no-brainer’. He said: “I am excited to bring Tom into our Phantoms family. In my opinion, he is the best British defenceman of his age. 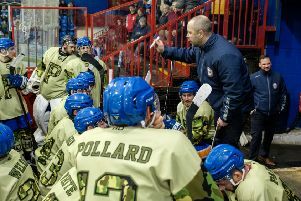 Stubley and Towner take the number of Phantoms’ new recruits to four. James Archer has also arrived from fellow EPL side Manchester Phoenix while Connor Glossop has been snapped up from lower-level Nottingham Lions. Phantoms are also understood to have signed import forward Petr Stepanek, but continue to refuse to confirm or deny the move. A Phantoms player has also moved in the opposite direction to Hull. Forward Brad Moore, who rose through the junior system in the city, will be a Pirates player next season.